Use the overview above to explore the stern section. Click on areas of interest. Hot spots to the immediate sides provide side views. Use the checklist below if want to be sure and see everything. - The engines would stand in one end zone as tall as goal posts. - The poop deck would overhang four stories above the other end zone. The port side of the stern section still has much of the side shell plating at B-deck. Since 1986, the upper half of the stern has lost most of the apparent height seen in the 1986 model version due to corrosion of the interior walls and pillars. Greater exposure to the open currents has accelerated the corrosion. The starboard side lost it's shell plating in the break-up. The aft half of the stern shows decisive implosion damage from being dragged under before the interior could completely flood. Again, much of the height of the ship has been lost due to internal collapses since 1986. Why doesn't the stern appear as intact as the bow section? Consult the section on the ship's breakup. 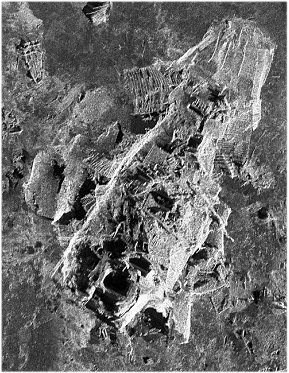 The model has two major errors due to the quality of the 1986 research materials. It was not apparent until the 2011 sonar mapping of the wreck site that the stern was bent to starboard by 10 degrees, centered under the 2nd class entrance. Knowing the stern is bent solved a number of mysteries I encountered when building the model. In the starboard well deck area, it seemed like there was a lot less distance between features than there was on the port side. That was due to the missing area being pushed under the overhanging upper decks. Why was B-deck bent so oddly and A-deck effectively shattered around the 2nd class entrances? They apparently did not take kindly to being twisted 10 degrees. I wish I had known this when I built the stern model. The other error was the propeller shaft placement. This structural drawing shows the shaft wings were torn from the hull and remained on the mud some 25 feet (7 meters) above the original line. Dr. Ballard was not able to locate and photograph the propellers in 1986. I guessed wrong there. In the raw WHOI video, it appears that Dr. Ballard descended down to where he thought the propeller should be on the starboard side except he was too far aft. He missed getting a photo of the propeller by only a few feet. What gives the stern its shape today is that the watertight bulkheads below D-deck provide some shape to the hull. The shell plating is not attached to the hull from the #6 Hold forward. What height there was to the upper decks, giving some of the shape seen on the model, has since collapsed. A-deck and the Boat Deck remains are nearly flat on D-deck now. Only the windows for part of the starboard wall of the 2nd Class Library on the starboard side remained in the 2011 survey. At the big vertical bend, the watertight bulkhead acted as a plow to mangle the interior decks from D-deck on down. The double bottom collapsed as well. 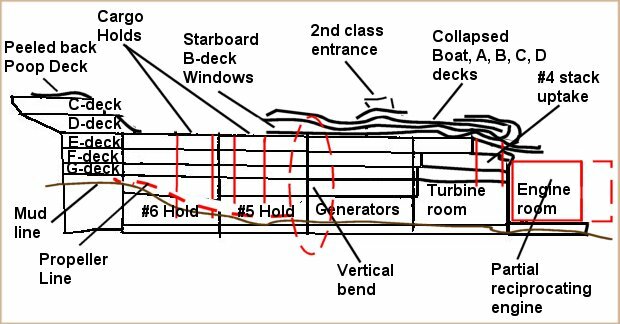 This drawing may be wrong as I suspect most of the deck spaces above have collapsed and all of the top surfaces are close to even with the tops of the engines. I would love to see more recent surveys. Travel from the port engine to the middle of the peeled poop deck in 1986. I provide a primer of the landmarks on the wreck and 15 overlapping photos! They're not great photos, but nobody else will show you this much, let alone tell you what you're looking at!